Monkeybrain goes ape, putting together a collection of all-star creators in the name of Chimp charity in this collection of stories that range from historical fiction to hysterical situations. 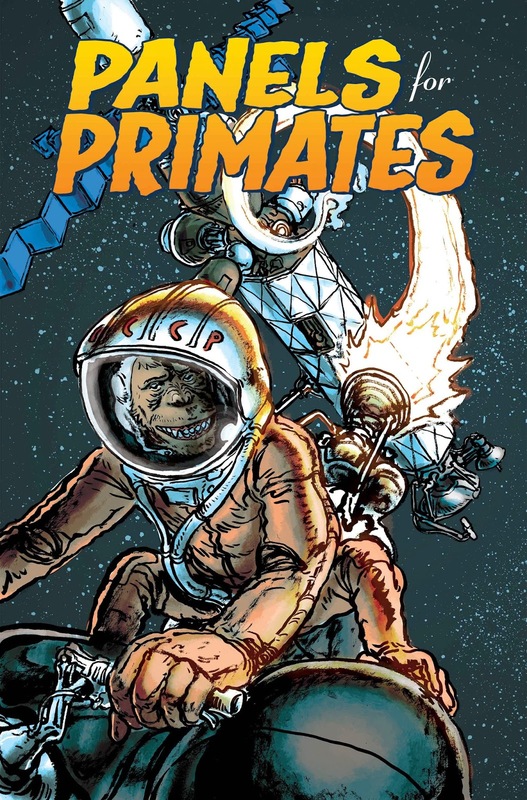 I had to include this one in my series, if for no other reason than the idea of a company called Monkeybrain putting together a themed anthology around primates. Add in the fact that the collection was built to benefit the Primate Rescue Center in Nicholasville, KY and that it features some of my favorite creators both from the big stage and mini-comics world, and I had to call attention to this one. Put together by Troy Wilson, this is a jam-packed comic that is extremely varied in tone but has a consistent style that helps it hold together. You won't find a single entry in this one that lags behind in terms of artistic quality. Nor does Wilson veer into experimental territory--there's nothing wrong with that, but in a book that's going to get the attention of more casual fans by having names like Stan Lee in it, you don't want them to turn to something that *I* might think is spectacular and edgy, but could come off as just doodles on the page to the wrong person. This isn't meant to be Study Group Magazine, and that's okay. What it does is absolutely spectacular, however. From the opening pages, where Stuart Moore and Rick Geary show that the monkey Russia sent into space might have been too smart for his own good to Stan Lee and Dean Haspiel's quick gag about how maybe evolution took a wrong turn, Panels for Primates works to tell as many good stories as possible in a few short pages. I love Rick Geary, so seeing him here was a nice surprise. He's a bit less wood block style in this case, but his depictions of the future where Planet of the Apes went wrong are hysterical. This one, combined with Stuart Moore's script, shows a comedic side we don't often see from Geary. Panel Patter favorites Fred Van Lente and Colleen Coover collaborate on a comical spy scenario that goes horribly wrong when the agent gets hungry. It's great to see Coover back to working on the things I first saw her draw, way back in Banana Sunday. Colin Upton takes on discrimination with an allegory, as a monkey tries to get work as a librarian and his interviewer thinks the worst of him. Played straight in between the worst-case scenarios, Upton's message extends beyond the species. If you're of the right age, Koko's Kitten will register all sorts of pleasant memories. Faith Erin Hicks talks about the story and even allows us all to keep our fantasies rather than the truth. Her style works great for the presentation, with lots of heavy inks. They say movies will be the death of us, and if Kevin Church and Max Riffner are correct in this space-age story, that might just be true. This one's a cute gag strip that times everything just right. Leave it to Ben Towle to find a little-known fact from World War I of all places and bring it to light in this anthology. With only one page, he tells the story of a monkey that aided in the war effort, giving the panels a lot of life and energy while still providing historical details. Morty Monkey comes by towards the end of the collection to clear up the differences in primates, with some help from Roger Stern and Caleb Hystad. While dealing in fact and depressing amounts of mistakes, Stern lets this one become a slow burn as Morty gets more and more annoyed at both his subject and his director. Hystad's art for this is perfect, as Morty is shown as a cranky old man and his backgrounds look a bit like animated stills. It's great stuff, and possibly my favorite in the anthology. Everything wraps up with some prose stories by Jame Delano and others that are illustrated by various folks, including John Byrne and Jeff Lemire. It's a neat touch to combine comics with illustrated stories, giving the reader just a bit extra and including folks who might not have otherwise had time to do an entire story. Panels for Primates is packed with popular people, and it's definitely worth the price, which is a bit higher than usual, at $9.99 for 80 digital pages. With so many good comics and the money going to a good cause, this is a win-win for readers and our cousins who will benefit from the money at the rescue center.